I have an Aristocrat Olympic penny slot machine. I need to get an appraisal on it's value for my insurance company. I have spent way too many hours searching the internet and have yet to find anything about this machine. 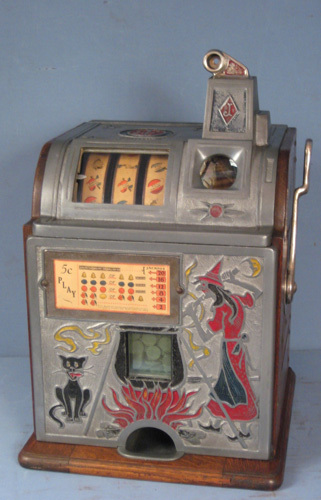 Does anyone know who I can contact that would know about this specific slot machine? This is a penny slot that is operated manually by pulling arm. It also lights up when plugged in. I think www.NationsAttic.com provides an appraisal service. Please post a picture of your machine. T.J. In the Uk these machines are very common, although they were made in Australia. The Carosel is the most common, if you look on ebay uk you will almost always see one for sale, just before Xmas you could get $385 for one now the market has slumped to $200 . I put a 'golden Dragon' on ebay last month and couldn't get the start price of $200 in fact. In the US I suspect they are a little rarer. go to the uk forum www.pennymachines.co.uk/forum put your needs on the market page there will be someone there who has the parts (i know for a fact one guy has more than 8 aristos in store.